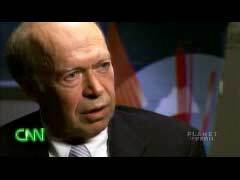 Although it seems like just yesterday, Monday marks the 20th anniversary of the day James Hansen, the head of NASA's Goddard Institute for Space Studies, told members of Congress the world was doomed if the burning of fossil fuels didn't immediately cease. To commemorate this inauspicious occasion, Hansen is going back to Capitol Hill to call for oil company executives to be put on trial for crimes against humanity and nature. Can you imagine the media firestorm this is going to create? Critical update: Audio of Hansen discussing this with NPR's Diane Rehm available here (h/t Anthony Watts). Waffling. Isn't that a great term coming from one of Nobel Laureate Al Gore's devotees? Regardless, it is going to be very interesting to see what kind of attention this gets from global warming obsessed media, especially coming just weeks after the embarrassing failure of Senate Democrats to get a carbon cap-and-trade bill off the ground. Also, will press outlets that cover Hansen's testimony address any of the criticism directed at the GISS chief concerning errors in how his organization measures and determines average global temperatures? Might there be any reference to a June 5 article in the British Guardian accusing NASA of literally cooking the books on this matter? Instead of suing big oil, I think the American people ought to seriously consider going after Hansen and Gore who are as much responsible for the energy and food crises by turning a minor largely natural, cyclical change into an earth-threatening, man-made disaster by manipulating both science and data. Environmental groups and some politicians share the blame and if we can't sue them, we can stop donating to their causes and/or kick the bums out of office. Maybe we can put Boxer's picture on Unleaded, Gore on high test and Hansen on Deisel pumps to remind folks where the blame really lies. In this Washington Post story, Sen. James M. Inhofe (R-Okla.) said the bill's failure was proof that Hansen's message had not caught on. "Hansen, Gore, and the media have been trumpeting man-made climate doom since the 1980s. But Americans are not buying it," Inhofe said. "It's back to the drawing board for Hansen and company as the alleged ‘consensus' over man-made climate fears continues to wane and more and more scientists declare their dissent." Readers are strongly advised to review all of the articles NewsBusters has published concerning the junk science being advanced by Hansen the last two decades. *****Update: Please don't miss fabulous posts concerning this matter by CEI's Chris Horner published at NRO's Planet Gore such as this, this, and this. In particular, don't miss Horner exposing Hansen for staging his June 1988 Congressional appearance by timing it for the hottest day of the year, and having the air conditioning turned off in the hearing room to make it especially toasty. Also, D'Aleo has more here.